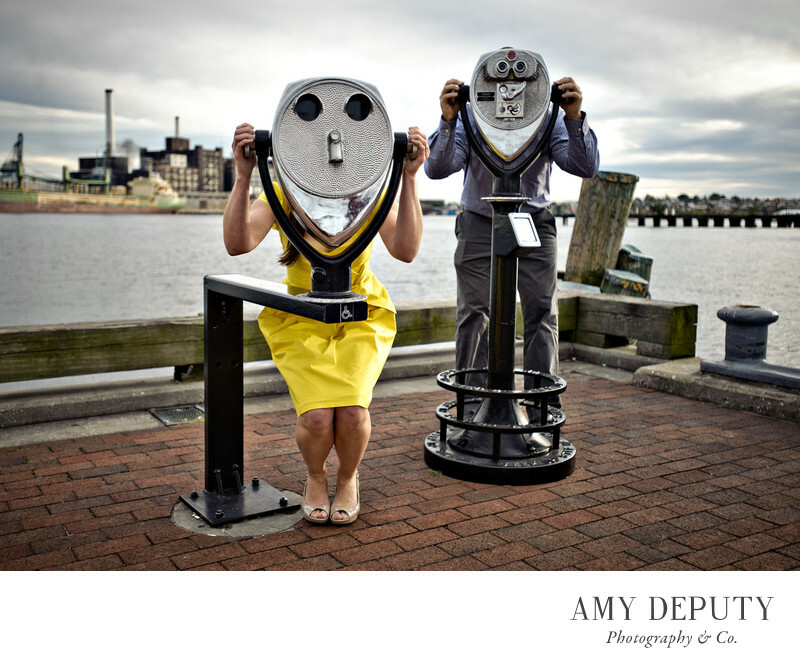 For quintessentially Baltimore engagement photos, head to Fells Point. This Baltimore neighborhood offers an array of bayside photo ops for a selection of playful to romantically classic images. Cobblestone streets and brick walkways wind around lively cafes, bars, eateries and shops as live music spills into the street. You can share a snowball with your sweetie or be inspired by a street musician's serenade for an impromptu dance. Fells Point is truly a location to capture something spontaneous and fun. I love this quirky engagement portrait of a couple standing against the backdrop of Baltimore's Inner Harbor, hiding behind these "masks." Added to the day's images of loving gazes and embraces, this shot offers up something unexpected.